Discount Roulette is the latest marketing tool. It's an exciting new way to bring customers into your shop. It is the perfect answer for designers & customers alike. Designers want to make money off their products & customers want things for free. This machine blends the best of both worlds. You are sure to make up the cost of making your item (Don't forget to promote it). Customers will have fun as they shop & have a chance of getting a great discount. Customers pay the amount shown, and then receive a discount ranging from 10% to 100%. The discount is given out randomly. It is easy to set up, takes less then 3 minutes. 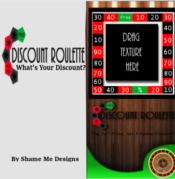 Discount Roulette is mesh item and has a 1 prim land impact and comes in COPY only. It comes with instructions. When updates are available, there will be free updates. Shame Me Designs is the home of Discount Roulette. There you can see the machine out, filled with a new item which gets cycled out every 2 weeks. You can also find Discount Roulette on Marketplace for your convenience.